The RYA ICC certificate ( International Certificate of Competence ) is available for powerboats , sailing yachts, motor yachts and jet skis and will allow you to helm these types of vessel abroad. It is not a universal license but is fast becoming the worldwide standard, for example it is not needed for helming these vessels in the UK, but still would help reduce your insurance costs. The RYA ICC certificate comes in 4 versions which are usually obtained by taking the appropriate RYA training course as detailed below. An ICC processing fee is payable to RYA if you are eligible, please read more here. 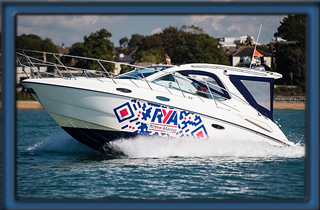 The RYA ICC powerboat certificate allows holders to skipper a powerboat of up to 10m in length in many international waters. Full details of the ICC certificate are below, but the best way to get you ICC certificate in the UK is via the RYA Powerboat level 2 course. The level 2 course runs for 2 days at a total cost of £249 per person and is available from our Southampton marina base. In summary, on completing the RYA Powerboat Level 2 course UK citizens may apply for their ICC certificate directly with the RYA. We also offer a 1 day RYA ICC direct assessment costing £199 for those who feel they already have the knowledge and skills needed. For those looking to skipper powerboats over 10m in length then the RYA Day Skipper practical courses would qualify for the correct ICC certificate. We also offer a 1 day RYA ICC direct assessment costing £499 for those who feel they already have the knowledge and skills needed. This includes use of our Fairline Phantom 40 & the ICC examiner. You will need a crew to help which you can provide or we can for £99. We also offer a 2 day ICC motor boat over 10m preparation and exam package. Have a days practise with a RYA Yachtmaster then take the exam on the second day on the same boat, our Fairline Phantom 40 all for £999. More ICC over 10 metres exam details here. Launching & recovery on a slipway, towing & being towed, collision regulations, buoyage & chart work, emergency procedures and much more. Everything you need to complete the RYA PWC jet ski course is included in the £149 course fee, so you ready to apply for the jet ski version of the ICC certificate. Our course fee includes use of our new SeaDoo jet skis, fuel, wet suit, life vest, RYA certificate, classroom and changing facilities. For members of the RYA the ICC application is fee, none RYA members will have to pay a fee directly to the RYA for the ICC. If you already hold the correct RYA qualification then you simply need to print out the form via the link below, complete it and send it directly to the RYA. An ICC processing fee is payable to RYA if you are eligible, please read more here.